Happy birthday to Quentin Blake (The BFG, Matilda, Clown) who served as the United Kingdom’s first Children's Laureate, 1999–2001, and Peter Dickinson (The Ropemaker). It’s the birth date of Marie Hall Ets (1893–1984), Play With Me, Nine Days to Christmas. Also born on this day were Jane Austen (1775–1817), Pride and Prejudice, and Sir Arthur C. Clarke (1917–2008), 2001: A Space Odyssey. It’s National Chocolate-Covered Anything Day. December has been designated Read a New Book Month. 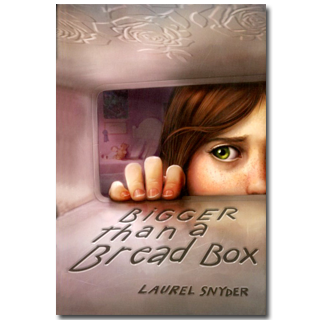 One of the best books of the last couple of years, Laurel Snyder’s Bigger than a Bread Box, features twelve-year-old Rebecca. Her life is suddenly torn in two when her mother takes Rebecca and her little brother, Lew, to live at her grandmother’s home in Atlanta, leaving the father Rebecca loves. Rarely has divorce as it is experienced by children been shown in such excruciating accuracy. From Rebecca’s point of view she belongs back in Baltimore with her father, school, and friends—but her mother remains clueless throughout much of the novel. So intense is her own pain that she cannot see what is happening to Rebecca. Were this all the novel explored, it would have been a sad but realistic story. But when Rebecca finds a bread box in the attic, magic enters the scene. If she makes a wish, and the wish can be contained in a bread box, it comes true. So an iPod, a diamond, even a seagull from Baltimore all magically appear. Of course, all Rebecca really wants is for her family to be back together. And, then she discovers the dark side of her bread box: as she gains items, someone else loses them. Eventually, she gains some perspective on her own situation. The problems of children facing divorce, the dark side of magic, the struggles of an engaging twelve-year-old not wanting to adapt to change—all these themes have been explored through superb storytelling. Rebecca endears herself to readers, who want her to have not diamonds, but what she truly needs, a cohesive family. Thought provoking and hopeful in the end, the book would be ideal to share with a book discussion group or class, grades five through seven. In the end it made me long not so much for a magical breadbox as to be able to go back in time to my own grandmother’s attic. Now that was a place of real magic. Thank you Laurel Snyder for this exciting book that will take many readers on many different journeys. I sat like that and thought about how Dad would come and rescue me. I made it into a little movie in my head. I pictured him driving up to the house. I pictured myself carrying Lew down the steps. I pictured Mom, wringing her hands on the steps, calling after us. I pictured us driving away. Originally posted December 16, 2011. Updated for . I’ve had this book on my tbr list forever. I think it’s time to read it. I’ve only heard great things. Thanks for the reminder! I’ve been meaning to read this for a while; thank you for the very appealing description. Ms. Snyder shares my love of two noted fantasy writers: Edward Eager and Ruth Arthur. Arthur was an incredibly gifted British YA author published by Margaret McEldery in the 70s. Her books had a darker element, unlike Eager. How I wish both had written more books! I own all them all, reread frequently, and look forward to adding Ms. Snyder’s books to that shelf. Laurel: The pleasure was all mine! I just hope this Almanac page leads others to your fabulous novel. Just ordered it from the library. Thanks for the heads-up, Anita. Laurel Snyder creates believable and memorable characters. They pop into your head when you’re driving to work, grocery shopping, or recommending a book to a fourth grader. She writes stories that keep readers turning pages and absorbed until the very last word. John: Thanks for your comments on the book — and thank you for recommending it to me in the first place! I am reading it to my third graders right now- they LOVE it. I thought it would be over their heads, but they beg for more whenever we stop.